In soccer, the team’s supporters are often known as the 12th man. That couldn’t be any more true of the Dark Clouds, the team supporters for Minnesota United, who will soon be moving to Major League Soccer. 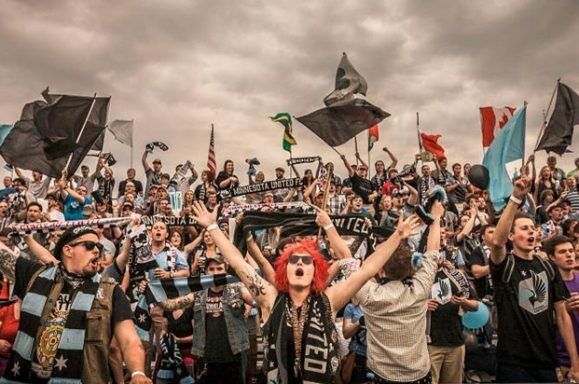 These days, the Dark Clouds regularly draw hundreds to games to sing, chant, wave flags and banners, and support their Minnesota United players for 90 minutes each and every game. No matter the weather, the score, or the play on the field, good or bad, the Dark Clouds bring it each and every game. The Dark Clouds, like professional soccer in Minnesota, are survivors. But things have not always been easy for the Dark Clouds. 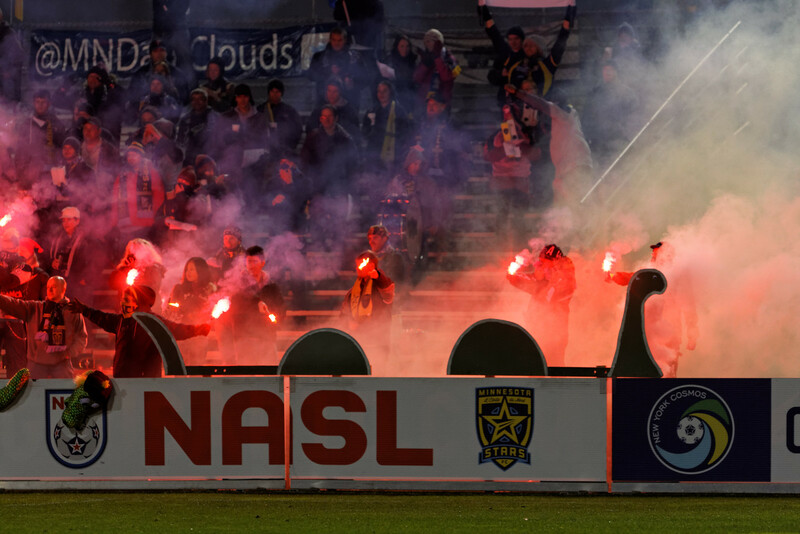 While much attention has been given recently to the newer supporters groups in the MLS like Orlando City’s Iron Lion Firm, the Dark Clouds have endured through almost a polar opposite. Minnesotans have had a team to support for 28 years, but in the last 14 years, their teams have seen three venue changes, four team names, six logo changes, and six different owners. The Dark Clouds, like professional soccer in Minnesota, are survivors. And not only have they survived, they’ve used the adversity to grow in strength. While the NSC had a far superior field, the seats at “The Jimmy” were much closer to the playing surface and fans looked just 70 yards across the field to see other supporters cheering on their team. It was there that the Dark Clouds started to gain momentum. 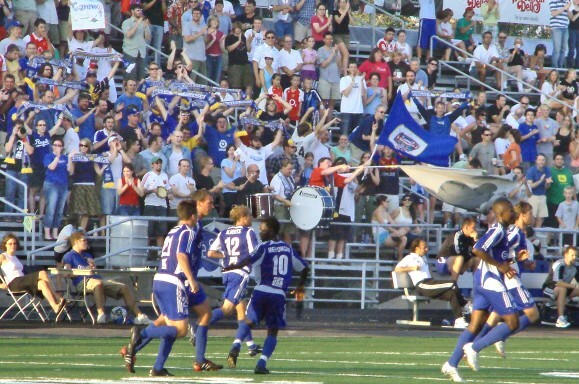 Dark Clouds support the Thunder at James Griffin Stadium for a 2005 US Open Cup game. Photo by Brian Quarstad. 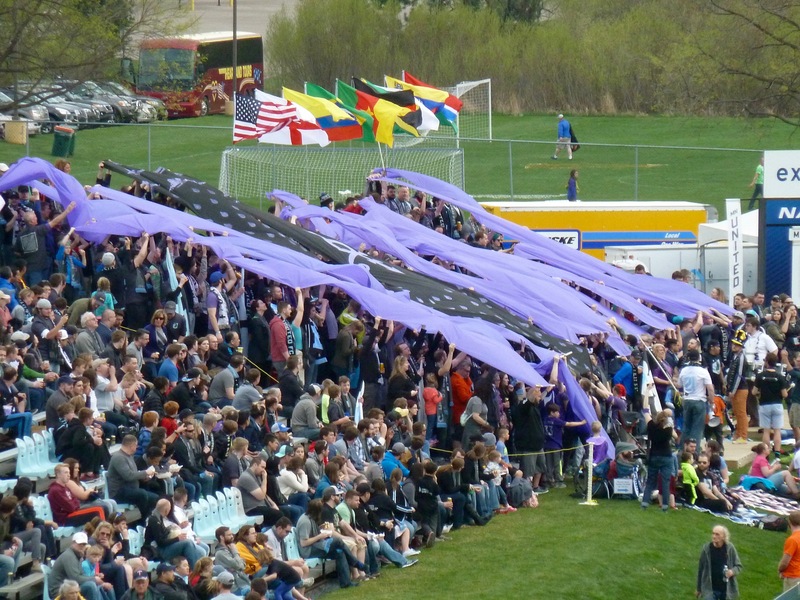 Andy Wattenhofer, one of the founders of the Dark Clouds, said the switch in venues was the catalyst for the supporters group. Anthony de Sam Lazaro first started attending Thunder matches in high school in the late 90s. He remembers a group of supporters at the NSC Stadium who used to be called the Thunderheads and would sit high in the stands with no shirts. They were perhaps the first semi-organized supporters section. However, de Sam Lazaro preferred to stand behind a short cyclone fence which had been set up to protect the field and worked as dasher boards. There, he and a handful of other fans started to congregate to harass opposing players, particularly goalkeepers, and cheer for his own team. “My recollection is it’s always been a pretty even split between positive support for our teams and heckling the opposition, which we’ve always tried to do by being clever or funny and getting a rise out of players,” de Sam Lazaro said. de Sam Lazaro explained that he met Wattenhofer and a few other soccer supporters like Bruce McGuire, another founder of the Dark Clouds, through an internet discussion board. The group would get together to watch US Men’s national team matches and, through that, they encouraged him to come and join in supporting the Thunder. McGuire had a friend who created a simple two-tone, cartoon-like drawing of clouds. He took one of those images and turned it into a small button that he distributed to his friends at games. Wattenhofer decided that the black cloud on a dark gray background was a good rallying symbol for Thunder supporters and purchased some material to create a flag. Dark Clouds supporters and sisters Amy and Analisa Fleischhacker, along with their mother, Cherie, created a large 9’ x 5’ two-sided flag to Wattenhofer’s specifications, replicating the cloud on McGuire’s button. They started flying that flag at matches and people soon knew where the supporters were, for good and bad, recalls Wattenhofer. Soccer fans in Minnesota were still not used to the idea of supporter sections, complete with songs, chants, jeers, clever teasing, and an occasional smoke bomb or two. 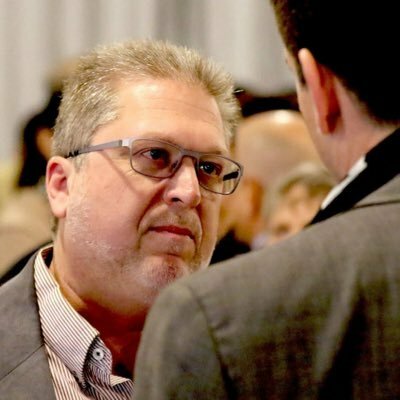 “People would call the Thunder front office and complain, saying, ‘those Dark Clouds people — I don’t like them, they’ve got a bad attitude,'” laughed Wattenhofer. de Sam Lazaro relays a very similar story, but also recalls a bass drum which signaled to supporters to come and join them. That very same drum, owned by another one of the founding members, Neal Logan, was endearingly named Ludwig. The drum is still used today after a major refurbishment a couple of years ago due to the wear and tear of many a different drummers and countless matches. In fact, Logan says Ludwig has been to almost every Minnesota pro soccer home match since 2004, as well as the 2011 NASL final in Fort Lauderdale and the 2012 final in Tampa. In 2008, the team was planning on playing at James Griffin for another season. But after two home matches, the team suddenly announced they were dropping their urban marketing campaign and moving 20 miles north to the suburbs of Blaine, Minnesota, for the newly refurbished playing field of the National Sports Center Stadium. It was a surprise announcement and one that was about to set the Dark Clouds into a spin. The team moved to Blaine and played several games with some stands removed and part of the field graded up. They played several more matches on the exhibition field adjacent to the larger stadium that had no seating. Finally, they moved into the newly revamped stadium. The Dark Clouds, who had often grown to numbers of 100 to 200 per game in St. Paul, were now struggling to find their place again. They moved to four different locations in the stadium trying to find the spot that made the most sense. To make matters worse, the very popular NSC beer garden was built in 2009 and many of the supporters gravitated there. Eventually, the numbers dropped with some games only having a dozen or so Dark Clouds in the same spot. With the supporters scattered throughout the stadium, there was no large contingent to formulate the energy that supporters sections create. Somewhere between 2010 and 2011, Wattenhofer along with a few others thought that perhaps the best place for the supporters was across the field from the main grandstands and away from the opposing benches or either goal. Others in the group felt that the separation from families and those who didn’t want to deal with flares and smoke bombs might be a good idea along with the notion that the general public who attends matches might actually appreciate the Dark Clouds more if they could hear them from across the field where the sound would carry directly across to the main grandstand. An added plus was that the Dark Clouds, who were rarely seen on camera from the live streaming of matches, would now always be in view. The plan worked and as Manny Lagos’s team did well on the field, the Dark Clouds continued to draw well in the east stands. In 2011, the Minnesota Stars went on a tear in the playoffs and found themselves in a home and away playoff for the championship after finishing in 6th place in the league standings. The team was league-owned and, in phoenix-like fashion, grew out of the ashes of the Minnesota Thunder — a mainstay of 2nd division pro soccer since 1995. Nearly all of the 4,511 fans had taken their seats — except for the Dark Clouds. As Minnesota’s captain Kyle Altman approached the tunnel that leads from the locker rooms to the field, he could hear the noise. It was loud. 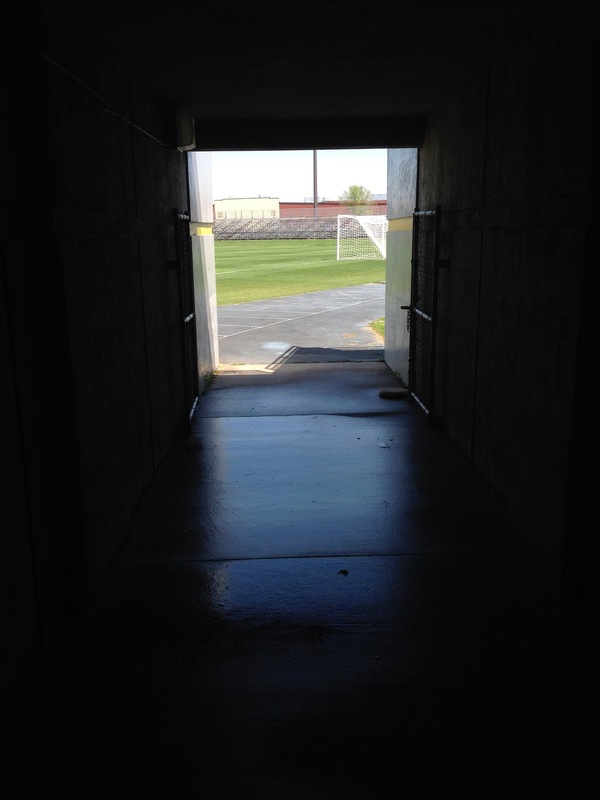 Now that he was standing with the other players in the tunnel, his eyes swept the east side of the stadium. He viewed something he’d never seen since joining the team in 2008. Many estimated the Dark Clouds to number well over 300 that night — the biggest section of supporters they’d ever amassed. With the help of the Dark Clouds, the Stars went on to win the home leg of the match 3-1. And, as had become a tradition that year, the players raced over to the supporters section after the win and sang Wonderwall as a thank you. Dark Clouds with flares for tifo in 2011. Photo by Jeremy Olson. Minnesota won the 2011 NASL Championship in Fort Lauderdale, Florida on a cool and rainy night just one week later. As to be expected, the Dark Clouds had a good contingent of traveling supporters who flew to Florida on short notice to support their beloved team. They weren’t disappointed. Soggy as the team they were supporting, they shared moments of sheer joy with the Minnesota players who naturally included them in their on-field post-match celebrations. 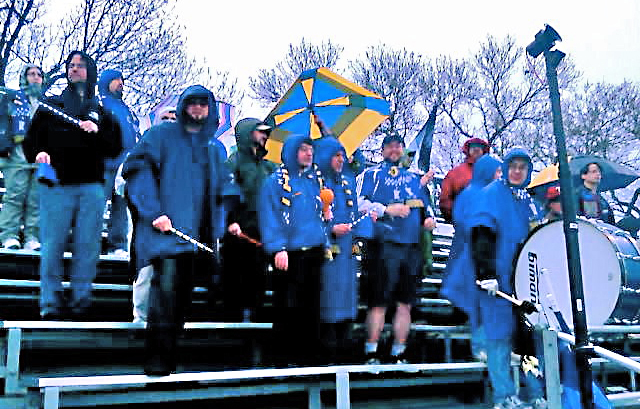 In 2012, it wasn’t unusual for the Dark Clouds to have several hundred supporters turn up for games on a regular basis. 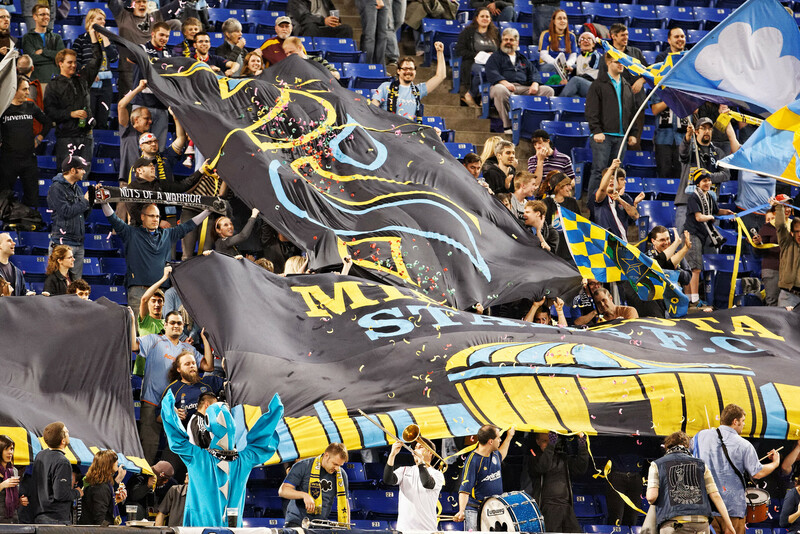 The number has steadily grown since Minnesota United matured in the NASL. The choreographed flares and smoke bombs have been sadly lost to stricter stadium regulations but the section maintains its individually created tifo. Today’s Dark Clouds stand on the southeast end line of NSC stadium where they moved in 2015. Walking into that section you will find a diverse group of people. Young and old, men and women, all tailgating before games and standing shoulder to shoulder to support their team. A wooden ‘capo stand’ sits in front of the section where supporters with megaphones help coordinate the songs and pick the crowd up when it quiets down. From the older founders of the group like Logan, McGuire, and Wattenhofer, to the younger members like Jim Crist, de Sam Lazaro, and Karnik, they all come from different places in life but gather together under the same Dark Clouds banner. They are all like family. To help new members get settled in, the Dark Clouds have started publishing a regular feature on their website called ‘Tradition Tuesday’ that recaps the group’s storied past. Alongside articles about the group’s name and the 2011 Championship game are those about more recent lore like the ‘Iron Skillet’; a joke about a training method made on a podcast and appropriated by the Dark Clouds with great success. Dark Clouds Prince tribute tifo – 2016. Photo by Brian Quarstad. Another change this year has been a new logo that replaced the symbol originally found by Bruce McGuire. The new, sleeker Cloud sits above the word ‘Follow,’ a distillation of the older supporters’ motto. Yet even with the new logo, the larger section, and the new location, the spirit of the group is essentially the same as the one that existed in 2004. Stand and support the team for 90 minutes; Win or lose, rush to the dasher boards after a goal and thank the players for their work after the game. Wonderwall is still sung when Minnesota United is victorious. Lets hope it’s a tradition that stays with the team long after they move to MLS. Nachiket Karnik contributed to this story.